Making something with your own two hands is a powerful activity that can definitely be a self-confidence booster. 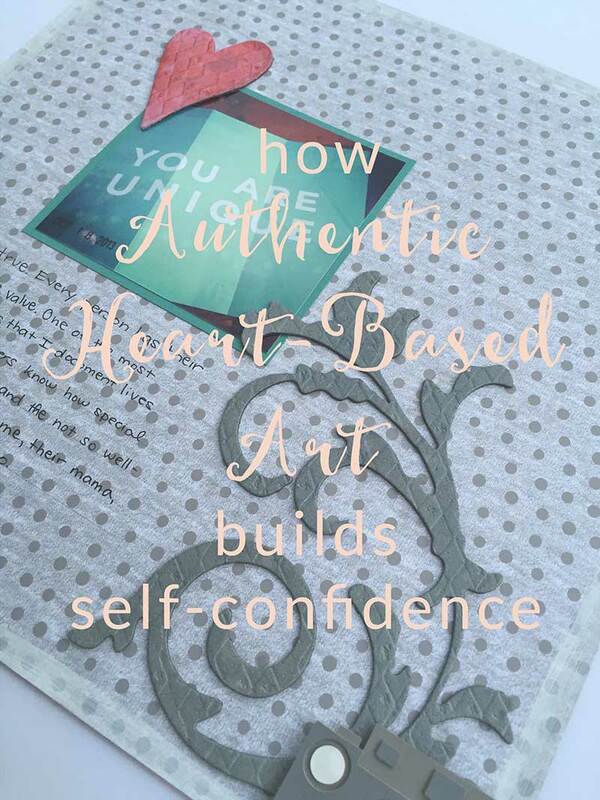 Be it drawing a picture for your child that they cheer for, coloring in a coloring book, making a blanket for a friend or loved one, or scrapbooking, the act of connecting with your heart through art is another beautiful way to increase your self-confidence and sense of self-worth. It’s not just the tactile, making, part of it but you can literally create art about self-confidence and self-esteem. Getting that struggle out, into your own creation can be a deeply cathartic process and, even if it’s subconscious, can help release some of that self-defeating, negative self-talk. Many people start scrapbooking because they want to document the lives of their children and that was definitely my doorway in to this hobby. 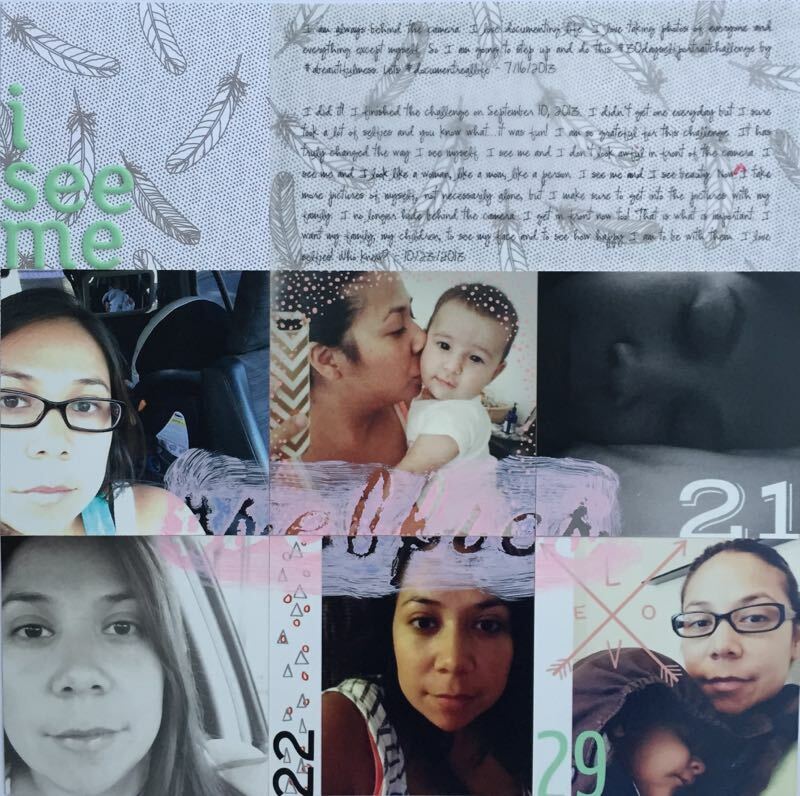 I made a few layouts about my daughter and about my relationship with my husband but none about myself during my first few years as a scrapbooker. 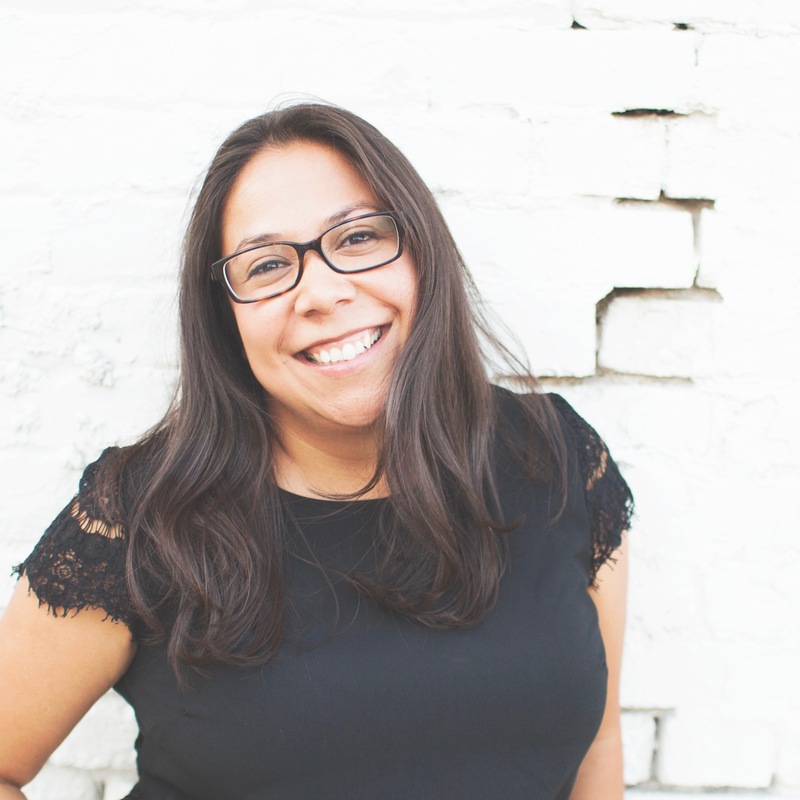 In the years since I started, with the help and inspiration of two amazing scrapbooking communities I have learned to use scrapbooking not only as a way to document the lives of myself and my family, but also, as a way to connect with who I am. On a creative or emotional journey, a supportive community related to your passions, sometimes called “your tribe”, can provide the encouragement you need to help you grow out of any shells or walls you’ve put up around you. In 2011, a few months after my mom passed away I joined a scrapbooking kit club called Scrapbooking from the Inside Out. 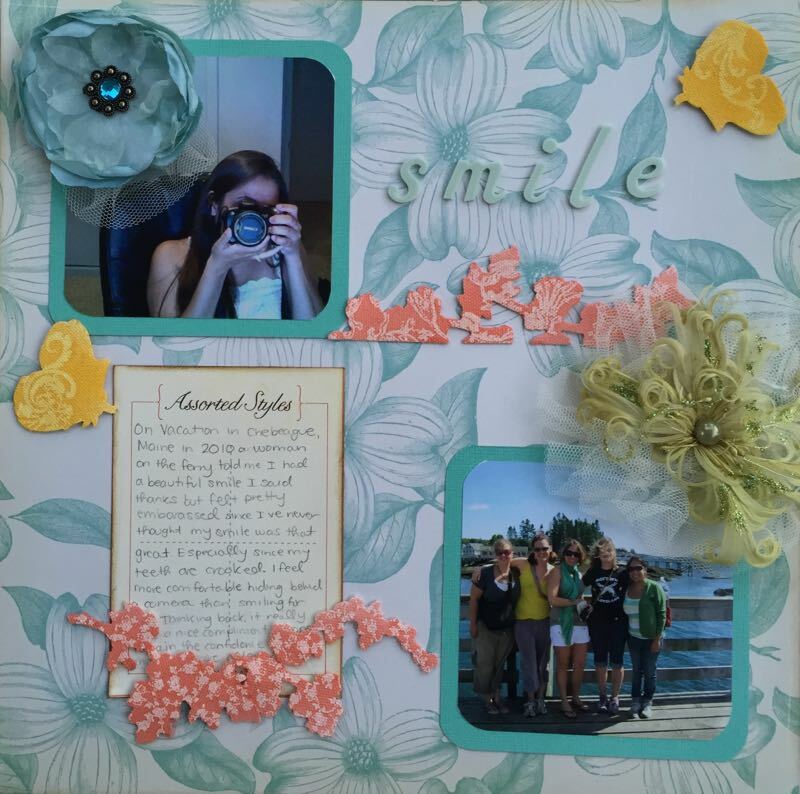 The mission of the group is to be an inspirational source, kit club, and online community for scrapbookers who want to explore their inner lives and deepest thoughts and dreams. The community and inspiration at Inside Out was just what I needed at a time when my sense of self was so very fragile. The prompts each month encourage you to connect with a different emotion and because I was on such a hard-fought journey of emotional connection, for a second time, I was so open to hearing that message and began making layouts about myself and about my own emotions and feelings. 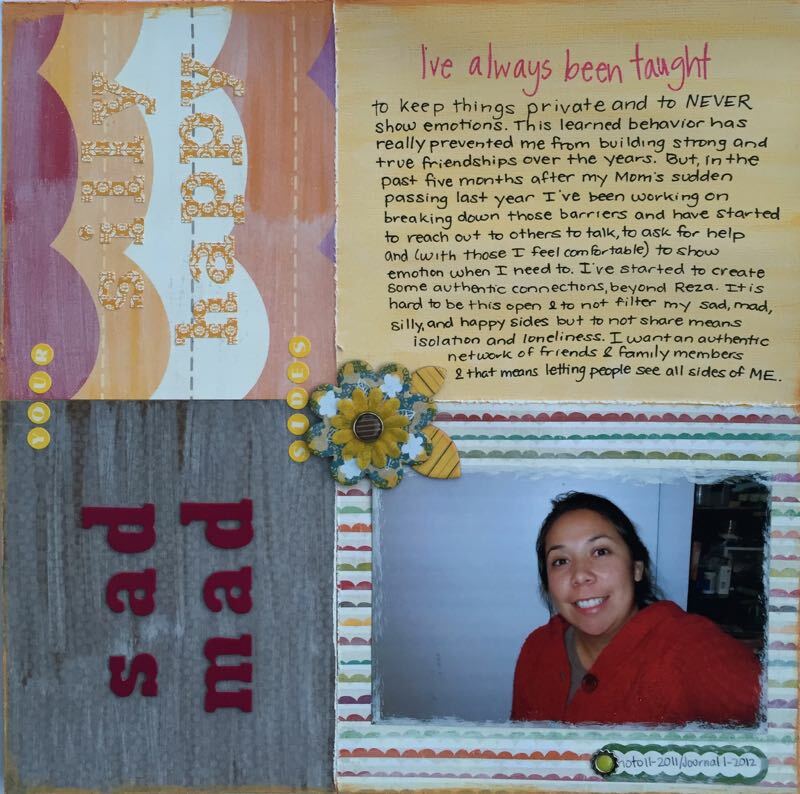 I made a lot of layouts while I was an Inside Out kit club member and today I wanted to share four scrapbook layouts that inspired my self-confidence and self-esteem during that emotionally vulnerable time. smile – documenting the time a complete stranger complimented my smile. That moment helped me build an awareness about accepting compliments and helped build my self-confidence around my own smile which I had always been self-concious of before. true brilliance – a layout about being brave enough to be an example of authenticity and vulnerability to my daughter in a world that often values comparison and external validation. your sad mad silly happy sides – a layout about letting go of the inherited trait of hiding true emotions and feelings and instead embracing all sides of me in order to build authentic relationships. Each of these layouts helped me a voice an inner feeling that I didn’t necessarily say out loud outside of my therapy sessions. Emotional connection is an essential part of building self-confidence and the art that I made with this group definitely contribute to that process. I joined the Simple Scrapper membership community at the beginning of 2013. This inspiring community is dedicated to helping women create space in their lives for scrapbooking to focus on what matters most. 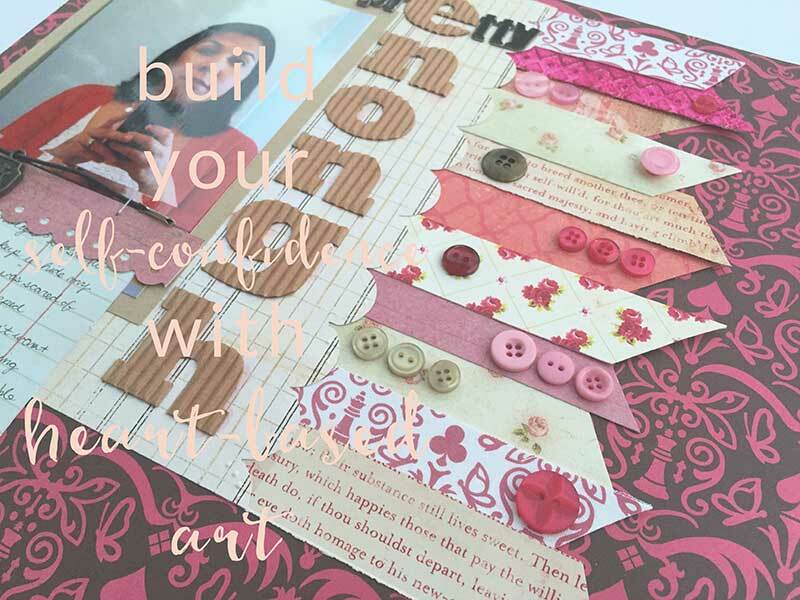 Through fun and challenging themes and layout ideas, alongside scrapbooking sketches and templates that helped me know where to start, my confidence in my scrapbooking abilities began to build and helped my overall self-confidence. i see me #selfies – a layout about participating in the #30dayselfportraitchallenge with A Beautiful Mess on Instagram. I took a picture of myself each day and posted it on Instagram and it helped with my self-confidence and self-esteem and reminded me of the importance of getting in front of the camera every now and then. 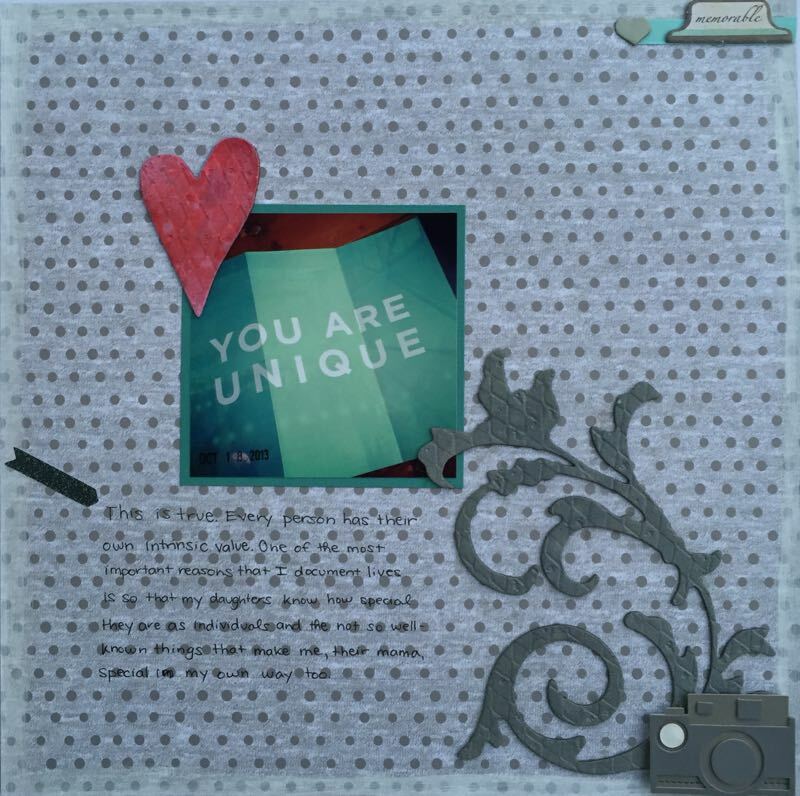 you are unique – a feeling focused layout about being a scrapbooker so that my daughters know they are special as individuals and so they know about the things that make me special as an individual too. I remember that as I was making these layouts I felt a sense of both nervousness and excitement. Nervous about the vulnerability and excited about the creativity. Creativity, especially if talking about emotions is difficult for you, can really help you push past those barriers to authenticity that often stop us in our tracks in real-life. Even as part of a community, when you’re creating something it can be just for you, or for a select few in a community that you trust, or for a broader audience. You get to decide who sees your work. Whatever audience you’re making for, its often the making that heals, not necessarily the sharing. If you’re currently struggling with or have ever in your life struggled with self-confidence, Go create something and document what you feel. It will build your self-confidence and can be fun in the process. I am here to support you in your journey and I am grateful for you. Thank you for spending a moment with me today. Do you dream of making art but lack the self-confidence to get started? What’s holding you back? Let me know in the comments or send me an email. I’d love to help you take the first step. P.S. Simple Scrapper is currently offering a 10-day free trial. It’s a wonderfully supportive, creative community. Sign up for your free trial today! Aw, very nice post! You definitely have a great smile! Using scrapbooking as a reflective process has probably become my favorite aspect of it, even though I didn’t use it that way for a long time. Great ideas. Thank you Patti! Yes scrapbooking for self-reflection, who knew right? =) I am so grateful for my connection to that aspect of the hobby, it has helped me grow in so many ways. I love love love this! It is so true. It’s also important to remember to not compare your creation with others. Just because someone has been doing it longer or is more naturally talented, doesn’t mean yours is any less good or meaningful. I love the concept of your blog, Marina! This is a lovely post. I have always wanted to make a scrapbook but never actually have. I really should set aside the time to do more physical type art, because for the past couple years I’ve been so focused on digital. I do a bit of calligraphy, but that’s about it lately as far as hands-on. I love the look of finished scrapbooks, and I know that I would LOVE to have it to look back on. I think I’m going to try to start one soon :) Great post. I love your blog, too. Glad to have discovered it :) Following you on Instagram! Thank you Amber! Scrapbooking has definitely evolved and there are so many beautiful and simple ways to get started documenting your life. Project Life is a great doorway into the hobby. Check out my Pinterest board for more ideas! I’m so glad you stopped by and thanks for the IG follow! Lovely. 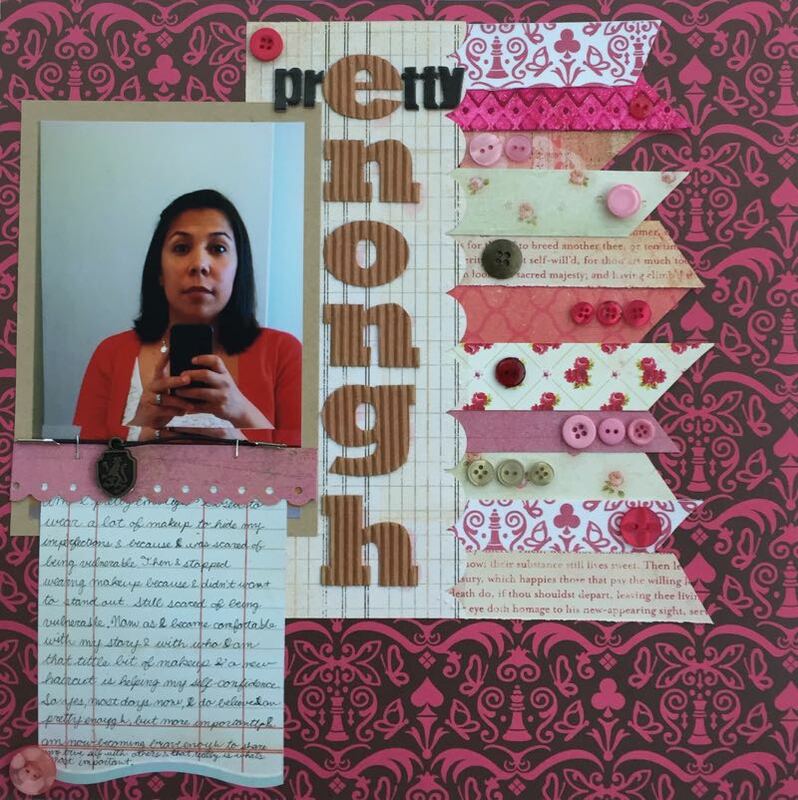 I had no idea that scrapbooking could be – well, so – personal. It’s like a 3D version of journaling. Of course, scrapbooking is about personal photos, but it sounds like you used it in such a healing and quiet way, almost meditative? Thanks Lani! I think scrapbooking is a creative outlet the same as painting, etc. You can use it in whatever way fits your needs. I got started in a very reflective way after my Mom passed; wanting to document some of my struggles and also create a record of life for my kids. It has certainly become a meditative process as it is a very “in the moment” practice as I just kind of go with papers, etc as I feel, definitely not overplanned. I am planning on sharing more of my creative practice this year. So stay tuned!